Swadron Associates is proud to call Sheldon Ward House home. Built by a prominent city councillor in 1845, the building has housed pre-confederation political figures, a synagogue and film production companies. The City of Toronto lists the building in its Inventory of Heritage Properties and has affixed a plaque at the building entrance. More about Sheldon Ward House. Check us out on Google Streetview. 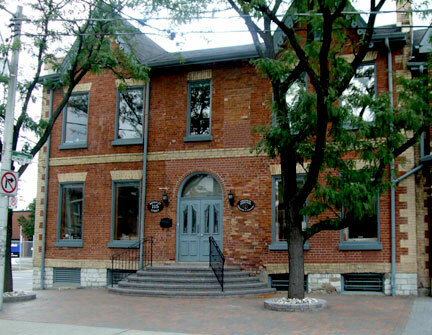 Swadron Associates is located in historic Sheldon Ward House at the corner of Berkeley Street and Richmond Street East in Toronto. From the Yonge-University subway line, exit at Queen or Osgoode stations to the 501 Queen Streetcar. Travel east and exit at Parliament Street and then walk one block south and one block west. From the Bloor-Danforth subway line, exit at Castle Frank station and take the 65 Parliament bus. Exit at Richmond Street East and walk one block west.